When people are planning a kitchen renovation project, they seek inspiration from a variety of outlets. It can be helpful to look through design magazines. Even if some of the kitchens presented are out of budget, you may be able to find less expensive alternatives, in terms of material and products. Sometimes it can be fun to look through other people's finished projects on Pinterest. People often share their renovated kitchens, bathrooms and other work that they have done on their home, and either link back to a personal blog or the source where they found the initial idea. This can be a treasure hunt, of sorts, finding the right designs to suit your home. Others take inspiration from the past, and some look to the future. Being on trend can be important to those who want their decor to be contemporary, and it can be a good idea to heed industry news like the announcement from Sherwin Williams where the company presented its colour of the year. According to the the paint maven, it has selected Oceanside SW 6496 as its annual shade offering. The hue is a bold blue with hints of jewel-like green tones and can be applied in a variety of rooms to evoke different moods and themes. It is rich enough for a Mediterranean-inspired space, the source noted, and modern enough to complement contemporary kitchen decor. Jazz up your kitchen with some eye-popping colours . A popular hue need not take over an entire room. In fact, it can look classier to add an accent wall, some bright tile or even just a kitchen countertop in a unique shade to brighten up the space. Those considering redoing their tile to complement a new kitchen sink, for example, do not have to dramatically change the room. Better Homes & Gardens advised that accenting with a bold colour can make a room outstanding, whether it is incorporated into a tile pattern or takes over an entire wall. Such a move can draw attention to a seemingly serviceable room like the kitchen, and make it into a place where people want to gather. Using this technique may be helpful if you are considering a new kitchen island. People like to spend time socializing and hanging out in the room if there is a space for them to do so. Both this piece of furniture and some attractive decor can make the kitchen more inviting. Many people do enjoy a more basic kitchen, but selecting a daring shade for kitchen cabinets can make them stand out and can present a retro vibe. 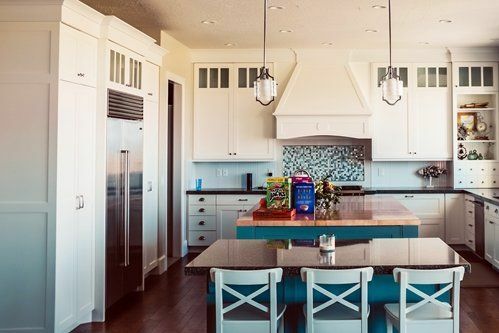 According to Architectural Digest, if you want to stick to a budget but make your kitchen more exciting, consider painting over your existing cabinetry. The source said that this design decision can give the room significant style, yet can also be a fairly simple undertaking. Whatever you decide, it can be helpful to discuss your options with a professional at a kitchen and bath showroom. He or she can guide you to the right transformation for you and your home: A bit of guidance is always a good thing when embarking on a home improvement project!